Farm Animals are always a favorite on little ones. The red with white gingham check long bubble has puffy sleeves with green lace along the trim of the sleeves and ankles. There is three hand smocked cows on the neckline. There is two buttons down the back and snaps along the inside of the legs to accomodate diaper changes. 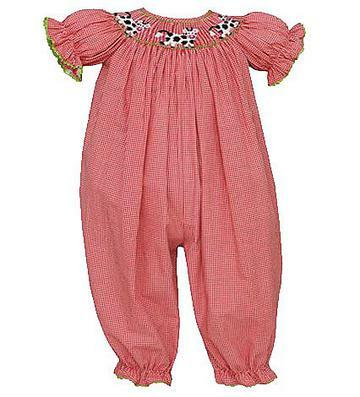 This adorable colored outfit is 100% cotton.